Aha! Seminars, Inc., is pleased to announce the availability of remote electronic seminars for genealogical societies and libraries. All of our one-hour genealogy lecture topics are available as live presentations using GoToMeeting®, a product of Citrix Systems, Inc. of Boston, Masssachusetts. LogMeIn is a leader in providing online meeting and training solutions for businesses and individuals. GoToMeeting allows for principal George G. Morgan to deliver live virtual seminars to genealogical societies via the Internet. These online seminars allow you to bring a world renown speaker to your society meeting without the travel and hotel expenses of having him travel to your location. The only expense you have is the seminar fee, which is $200 per one-hour lecture. George or Drew can present one or two seminars at a per-lecture price. * Wireless connections may be less reliable than wired connections. 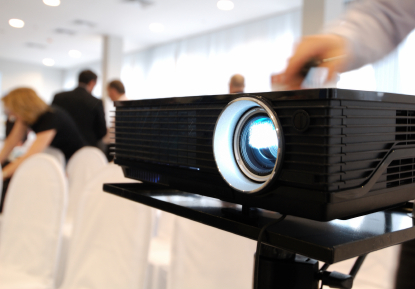 ** The speakers should allow all attendees to easily hear the presentation. External speakers may be your best option. We will work with your coordinator in advance to test the equipment and Internet connectivity. On the day of the presentation, we'll make connection and test one half hour before the presentation begins. We will provide you with a PDF version of the lecture handout and you can produce handouts for distribution at the session. We work together to decide how to best handle Q&A at the conclusion of the lecture. You can download a PDF form of the Presentation Services Agreement by clicking on the link under the Online Genealogy Seminars menu item on the left side of the page. You can fill in the blanks to get started right away! Please contact us at aha@ahaseminars.com or at (813) 220-6274 for more information and to schedule your society's virtual lecture!